Recently, a group of researchers in New Zealand suggested that the absence of fossils between 25 and 22 million years ago indicated that the islands completely disappeared under water, and then later re-emerged. But a newly discovered fossil reptile suggests this theory does not hold water. Alan Tennyson, Curator of Fossil Vertebrates at Te Papa, and colleagues, found the remains of a fossilized reptile jaw at St Bathans in Otago. 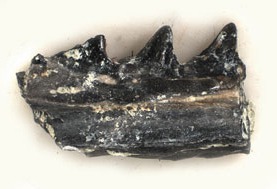 The teeth in the fossil jaw and their wear patterns is unique to the tuatara and its ancestors. But what is most exciting about Alan’s fossil is its age: it dates to just 3 million years after a time when other researchers have suggested the land mass sank beneath the waves. If the entire land area was submerged, the ancestral tuatara discovered by Alan and his colleagues, and all of New Zealand’s biodiversity, could only have arrived after the land re-emerged. To do this, the ancient reptile would have had to cross vast oceans – an unlikely feat for an animal that is a poor swimmer that would have rapidly dehydrated in salt water. It’s not just the tuatara fossil that suggests New Zealand did not fully drown. There are many different species in the St Bathans fossil deposit – about 24 species of birds, as well as plants, insects, and freshwater fish. There is no evidence that these species lived in Australia at the time, and most would not have been able to survive a lengthy sea journey. This suggests that ancient New Zealand did not disappear, but remained as an isolated island chain, allowing many species to survive and then repopulate as the continental crust re-emerged. These explanations are all very interesting, but they are based on the Assumption that scientists have accurately dated the rocks that these fossils come from! Unfortunately the various radiometric methods have all proven to be highly inaccurate, as any honest scientist will admit. So all we are left with is elegantly phrased guesswork and imaginative scenarios presented as scientific fact. One of the problems with the fossil record in New Zealand is that much of the land was formed from sediments that had accumulated offshore between the east of Antarctica and the west of Australia were squeezed together by several tectonic plates. They were consolidated and pressured into huge folds and uplifted and formed a New Zealand microcontinent. Hence, most fossil deposits in New Zealand are of marine origin, which is what makes the St Bathan’s freshwater/terrestrial deposit so important. Jurassic dinosaur fossils found in New Zealand indicate affinities with Australia and Antarctica. If the SI of New Zealand was closer to Antarctica, should we compare its fossils to Australian species? Thanks again for a great post! Looking forward to more.